SV transmembrane protein VAMP mediate SV exocytosis5. Of note, syntaxin and SNAP25 are located all over the neuronal plasma membrane, indicating that these proteins cannot account for the restriction of transmitter release to active zones17. The active zone plasma membrane also contains voltage-gated Ca2+ channels, although the degree of accumulation with respect to nonactive zone regions is not entirely clear and may vary between synapse types. Theoretical considerations suggest that docked SVs may be randomly distributed at an active zone while calcium channels may be clustered in subregions of the active zone plasma membrane. Distinct distances between SVs and calcium channels might account for distinct neurotransmitter release probabilities. Release competent SVs must be located close to calcium channels (less than 300 nm, presumably less than 50 nm) to account for the short time delay of 0.2 ms between Ca2+ entry and exocytosis3,18,19. The emerging importance of active zone transmembrane proteins for cell adhesion, synapse formation, and trans-synaptic signaling is discussed in other chapters of this book (Chapters 4-10). Of note, synaptic junctions can be purified biochemically, suggesting tight trans-synaptic binding interactions. Electron microscopy shows that such purified junctions contain both the CAZ and its postsynaptic equivalent, the postsynaptic density (PSD), as well as fibrous structures spanning the synaptic cleft7,16. This suggests that a protein scaffold composed of transmembrane proteins as well as the proteins of the CAZ and the PSD may serve as the backbone of synaptic junctions. Piccolo7,20,21. These proteins are large multidomain proteins lacking a transmembrane region, which directly or indirectly bind to each other and to several other synaptic proteins, thus potentially generating a supramolecular structure of unusual size. Intriguingly, CAZ proteins also bear crucial importance for several steps of neurotransmitter release. Munc13 isoforms are essential for evoked neurotransmitter release, presumably by conferring fusion competence to docked SVs21,22. 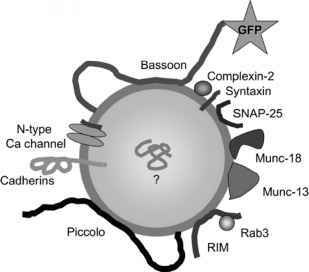 In addition, these proteins play a role in synaptic plasticity23,24. Likewise, isoforms of RIM are required in normal SV exocytosis and in synaptic plasticity25,26. RIM binds a large number of presynaptic proteins, including the CAZ molecules Munc13 and Liprins27-29. Liprins in turn interact with receptor tyrosine phosphatases called LAR, which are involved in active zone assembly30. CAST/ERC is thought to act as scaffolding protein; it interacts with RIM, Liprin, Bassoon, and Piccolo31,32. Bassoon and Piccolo are the largest CAZ proteins with 420 and 550 kDa, respectively. At conventional synapses, Bassoon is required for the function of a subset of synapses33. At photoreceptor and inner ear ribbon synapses Bassoon has additional roles in the formation and function of synaptic ribbons, i.e., specialized cytoskeletal structures involved in SV dynamics15, 34-36. 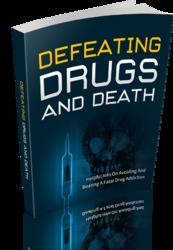 Thus, the CAZ represents an exceptional accumulation of proteins controlling neurotransmitter release. These proteins directly or indirectly interact with each other and may in fact represent one giant supramolecular complex ultrastructurally visible as the presynaptic grid (see above). Via various interactions they are directly linked to proteins of the exocytic machinery. 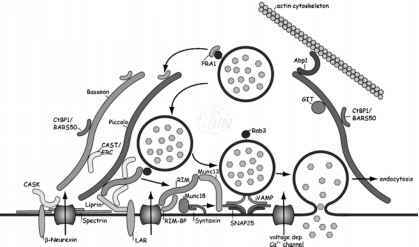 For example, Munc13 interacts with syntaxin, RIM interacts with the SV-associated protein Rab3a and with the putative calcium sensor protein of SVs, synaptotagmin7,37 (Figure 16.1; Colorplate 10). The current notion holds that the CAZ confers the spatial and temporal coordination to the exocytosis machinery that is a signature of neurotransmitter release. Figure 16.1. Molecular Organization of the CAZ. Few CAZ-specific proteins, including the Rab3-interacting molecules (RIMs), the SV vesicle priming factor Munc13, the two related scaffolding proteins Bassoon and Piccolo, and the CAZ-associated structural protein CAST/ERC, are specifically localized at the active zone. They are thought to localize and organize membrane trafficking events of the SV cycle and connect it to the active zone membrane proteins, including voltage-gated Ca2+ channels and cell adhesion molecules such as neurexins. Further components that are not exclusive CAZ components include the Ca2+/calmodulin kinase domain-containing membrane-associated guanylate kinase CASK, the transcriptional co-repressor CtBP1/BARS50, the RIM-binding proteins (RIM-BP), the prenylated Rab3 acceptor protein PRA1, the ARF-GTPase-activating protein GIT, the receptor tyrosine phosphatase LAR and its interacting protein Liprin, components of the SNARE complex and its control elements (e.g., Munc18). The interaction between Piccolo and the actin-binding protein Abp1 is thought to link the active zone to the neighboring endocytic zone. For further details see Gundelfinger, Altrock and Fejtova, Active zone in: Encyclopedic Reference of Neuroscience (Field editor: M. Takahashi, Springer Berlin, in press). The picture was taken from the website of the Institute for Neurobiology (http://www.ifn-magdeburg.de/en/departments/neurochemistry_and_molecular_biology). See Colorplate 10. Functional active zones can form within 30-60 min of initial contact between axon and dendrite38'39. Piccolo and Bassoon are among the earliest proteins to appear at nascent synapses, and arrive simultaneously with or prior to functional SVs, consistent with a role of these proteins in synapse assembly40,41. How are active zone proteins transported to nascent synaptic sites? In particular, how are CAZ molecules transported and what is their contribution to synapse assembly? Recent studies have addressed this question in detail and identified a novel type of vesicular organelles that appear to represent mobile active zone precursors. Using antibodies against either Piccolo or Bassoon a previously unknown type of vesicular organelles could be affinity-purified from embryonic rat brain (day E18)41'42. Ultrastructurally, the purified organelles resembled vesicles detected in electron microscopy studies in axons of developing spinal chord43, and were later also detected in axons of cultured neurons41. These vesicles are 80 nm in diameter, have an electron-dense lumen, and are coated with electron-dense projections highly reminiscent of CAZ material of active zones41,43. This morphology raised the possibility that the vesicles carry CAZ material on their cytoplasmic surface to the presynapse. Indeed, the projections emanating from these vesicles are immunopositive for Bassoon and Piccolo in electron microscopy41, and were therefore termed Piccolo-Bassoon transport vesicles (PTVs). Initial biochemical analysis of purified PTVs revealed that they carry not only Piccolo and Bassoon, but also the plasma membrane SNAREs Syntaxin and SNAP25, and A-cadherin, a cell adhesion protein found at mature synapses. By contrast, SV proteins, such as synaptophysin, synaptotagmin, synaptobrevin/VAMP2, or vesicular neurotransmitter transporter GAT1, were not detected on PTVs. Further biochemical analysis revealed that PTVs indeed contain a comprehensive set of active zone proteins, including RIM1, Munc13, N-type voltage-gated calcium channels, and the syntaxin binding protein Munc18 (Figure 16.2)41,42. Figure 16.2. Proposed Molecular Composition of a Piccolo-Bassoon Transport Vesicle (PTV). In addition to the exclusive CAZ proteins Bassoon, Piccolo, RIMs and Munc-13s, the postulated active zone precursor vesicle incorporates integral membrane proteins, such as N-type calcium channels and A-cadherin, and proteins that control priming and fusion of SVs41'42. EGFP-tagged Bassoon has been very instrumental for the analysis of PTV trafficking. Based on this striking composition the active zone precursor vesicle hypothesis emerged, which predicts that (i) PTVs may allow for transport of the entire complement of active zones proteins, and (ii) exocytosis of very few such vesicles could generate primordial active zone, suggesting a quantal and rapid assembly of presynaptic sites for neurotransmitter release41,42 (Figures 16.3 and 16.4).